By William K. Alcorn | July 27, 2018 at 12:01a.m. Nine girls and five boys ranging in age from 4 to 9, took center stage Thursday, as they vied for Little Prince and Little Princess of the 20th annual Our Lady of Mount Carmel Basilica Italian Festival. The four-day festival on the church grounds at 343 Via Mount Carmel runs through Sunday , with daily entertainment and the usual array of Italian-themed food. Crowned Little Princess was Alexandra Cook, 5, of Canfield. 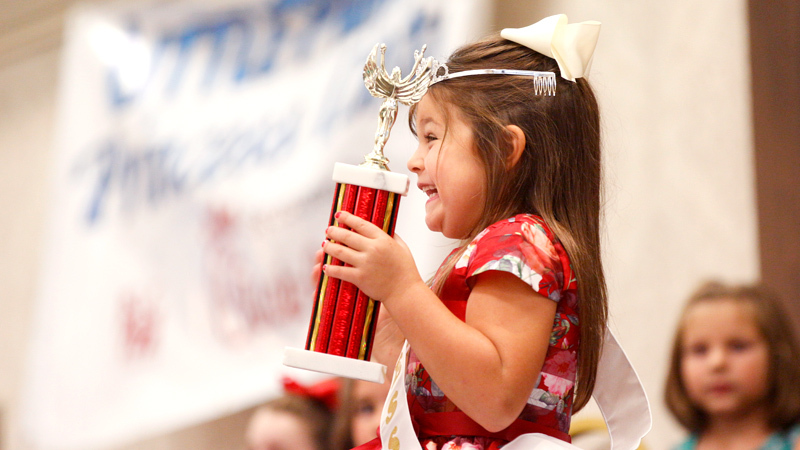 First runner-up was Callista Whorten, 5, also of Canfield. The 2018 Little Prince is Jack Antos, 5, of Girard, and first runner-up is Anthony Jannone of Struthers. The candidates, who must be Italian or of Italian descent, were judged on personality, smile, and how well they responded to questions posed by pageant emcee and television personality Jim LoBoy. The pageant, organized by Mary Ann Cardiero and Janice Kutsko, was sponsored by Boardman Chick-Fil-A. The festival features small rides, numerous food venues, an auction with 285 items, and a homemade wine-tasting on Saturday. This year’s main stage entertainment, performing Saturday and Sunday, is Moreno Fruzzetti of Pisa, Italy, a favorite who has sung at the festival several times over the years, said Joyce Frattaroli. Thursday was opening day, but the opening ceremonies are at 7 p.m. today in the church social hall and will include recognition of the festival’s 2018 Woman of the Year, Phyllis Ricchiuti; Man of the Year, Don Ronyak; and Lifetime Achievement Award recipient Ann Desimone. Among the many vendors at the festival is Bob McGuire’s Coney Island, which serves gyros, hotdogs and glazed kolbasi, who has been at the festival for two years. Operating the stand were April Ramahi and Cassandra Perry, both of Boardman. McGuire also has a Coney Island restaurant in Boardman’s Southern Park Mall. Two Campbell couples, Frank and Barbara Heri and Al and Janie Antonelli, have volunteered several years at the festival. Al and Frank man the gates which only performers are permitted to use, and Barbara and Janie sell tickets for the bar. The parking is free and after the Mount Carmel lot is filled, parking lots at United Way, St. Cyril & Methodius Church, the IBM Building, Levinson Tire and the YMCA are open, with buses available to bring people to the festival, Additionally, golf carts will shuttle people to the entrance free of charge. Joyce Frattaroli, who along with her husband, Frank, have chaired the festival for five years, invited people to come to meet people they know, and enjoy the food and music and all things Italian. July 21, 2017 12:01 a.m.
July 20, 2017 10:55 p.m.
July 22, 2018 12:05 a.m.
July 23, 2015 12:05 a.m.